Have you ever read about a successful Corporate Social Responsibility (CSR) project through a company’s communications and thought to yourself, “wow — they sure were able to accomplish a lot all by themselves”? In a small percentage of scenarios, that very well may be the truth. But through my work with businesses around the world over the years, I’ve learned that it’s often different. In most cases where the company seems to claim all the credit they are simply not telling the whole story. Or, to put it another way, simply bragging. This isn’t smart. When it comes to creating an effective CSR communications strategy, it is important to give credit where credit is due. Sharing credit in a liberal way is not only more honest, but it is also better in every way and will actually benefit your company. The reason is simple. Credit for CSR is not a zero-sum game. If you don’t mention important players, it doesn’t give you any more credit. When you make the decision to share credit with those who have contributed to your project, it doesn’t mean your company will get less credit for that project’s success. In fact, you get more credit and more value. Sharing credit helps establish relationships and gives you more willing and engaged partners to work with. And, they will often return the favour, citing your work and value in their own communications. Whenever it is possible in your CSR communications, take the time to acknowledge the work of all parties who made contributions to the success of the project or work — both inside and outside of your organization. This could be in press releases, quotes for news articles, social media channels, presentations, or even casual conversations. 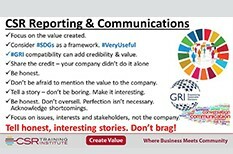 Your CSR communications can add a lot of value if done right. 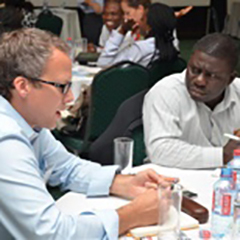 As always, CSR Training Institute understands that the process of introducing Corporate Social Responsibility into your business strategy can be overwhelming. That’s why we are here to help. If you are struggling to move forward, we will work with you to cut through the confusion and help you align business, social and environmental performance goals.